Auroras have signified different things to different cultures. The Vikings thought that auroras were reflections off the armor of the mythical Valkyries. To the native Eskimos of Greenland and nearby Canada, auroras were communications from the dead. In medieval times, auroras were omens of war or disasters, such as plague. Today, we know that they're a light phenomenon caused by high-energy particles from the sun's solar winds interacting with the Earth's magnetic field. 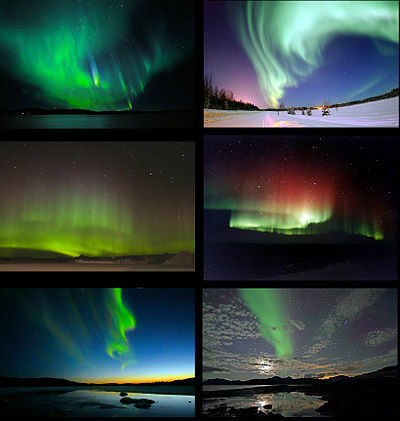 However, knowing the physical reason for auroras certainly doesn't detract from these beautiful natural light shows. Auroras can be green, red or blue. Often they will be a combination of colors, with each color visible at a different altitude in the atmosphere. After a particularly active solar maximum in the sun's cycle, the red color may appear at altitudes between 90 and 100 km (54 to 60 miles). Oxygen ions radiate red and yellow light. Nitrogen ions radiate red, blue and violet light. We see green in regions of the atmosphere where both oxygen and nitrogen are present. We see different colors at different altitudes because the relative concentration of oxygen to nitrogen in the atmosphere changes with altitude. Auroras can vary in brightness. People who regularly observe auroras and report on them generally use a rating scale from zero (faint) to four (very bright). They'll note the aurora's time, date, latitude and colors and make quick sketches of the aurora against the sky. Such reports help astronomers, astrophysicists and Earth scientists monitor auroral activities. Auroras can help us understand the Earth's magnetic field and how it changes over time. Because the Earth's magnetic field is three-dimensional, the aurora appears as an oval ring around the pole. This has been observed from satellites, the International Space Station and the space shuttle. It isn't a perfect circle because the Earth's magnetic field is distorted by the solar winds. Auroras are indicators of the connection between the Earth and the sun. The frequency of auroras correlates to the frequency of solar activity and the sun's 11-year cycle of activity. As the process of fusion occurs inside the sun, it spews high-energy particles (ions, electrons, protons, neutrinos) and radiation in the solar wind. When the sun's activity is high, you'll also see large eruptions called solar flares and coronal mass ejections. These high-energy particles and radiations get released into space and travel throughout the solar system. When they hit the Earth, they encounter its magnetic field. The poles of the Earth's magnetic field lie near, but not exactly on, its geographic poles (where the planet spins on its axis). Scientists believe that the Earth's liquid iron outer core spins and makes the magnetic field. The field is distorted by the solar wind, getting compressed on the side facing the sun (bow shock) and drawn out on the opposite side (magnetotail). 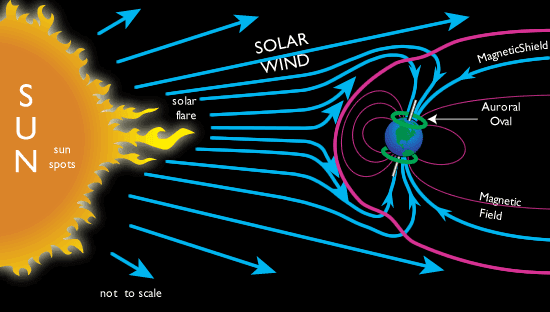 The solar winds create an opening in the magnetic field at the polar cusps. Polar cusps are found on the solar side of the magnetosphere (the area around the Earth that's influenced by the magnetic field). Let's look at how this leads to an aurora. As the charged particles of solar winds and flares hit the Earth's magnetic field, they travel along the field lines. Some particles get deflected around the Earth, while others interact with the magnetic field lines, causing currents of charged particles within the magnetic fields to travel toward both poles -- this is why there are simultaneous auroras in both hemispheres. When an electric charge cuts across a magnetic field it generates an electric current. As these currents descend into the atmosphere along the field lines, they pick up more energy. When they hit the ionosphere region of the Earth's upper atmosphere, they collide with ions of oxygen and nitrogen. The absorption of energy by oxygen and nitrogen ions causes electrons within them to become "excited" and move from low-energy to high-energy orbitals.